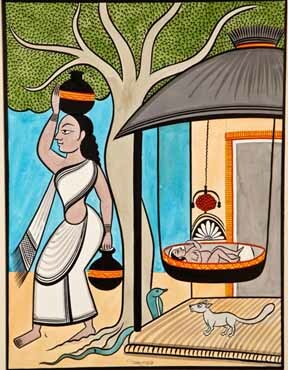 Why choose the Panchatantra as a theme for an exhibition of art? What is contemporary about a collection of animal fables that is over 2000 years old? The King of Heaven be. Charged with igniting the minds of three dull-witted princes whose political education was consigned to his charge Visnusarma’s Panchatantra has not yet finished saying what it has to say. Its philosophy, both profound and practical remains relevant today, not only for aspiring princelings and political hopefuls but for the rest of us as well. This marvelous text on political thought niti shastra and the wise conduct of life comes to us fresh and vibrant over the millennia’s, its complexities cloaked in fables. The prose punctuated with maxims, proverbs and other wisdoms, the stories framed within stories, leading us on and enfolding into other stories. Didactically powerful the five discourses of the Panchatantra stakeout a vast territory of statecraft. Book one covers the Loss of friends and discord among allies; Book two on Securing allies, winning friends; Book three is on War and peace; Book 4: On loosing what has been gained and the final discourse in Book V is on Hasty Actions and Rash Deeds. Like swans that extract milk from water mixed. Over the millennia the source text of the Panchatantra with its universal truths spread across the boundaries of the sub-continent to be told and retold in the many tongues of travelers and courts and from teller to teller. The recensions of the fables are evident from the adaptations and versions that multiplied in the telling, which not including the numerous languages and dialects of the subcontinent itself, are said to be over two hundred in number, in more than fifty languages. From a Pehlevi version (550-578 CE) to a 570 CE Syriac one and then the Arabic Kalilahwa Dimnah dated to 750 CE; traveling further to medieval Europe and the Fables of Bidpai and thence to the German Das der Buch Beyspiele (1483), the Italian La Moral Philosophia (1552) and on to its influence on Aesops Fables, the Fables of La Fontaine, the Grimm Brothers tales and others. Altered to suit audiences and differing cultural milieus, adapting to the changing centuries remaining ageless in its sheer widespread popular appeal. This exhibition refocuses our attention on this ageless and universal core of this great text and its continuing and continuous appeal two millennia later, schooling us, as he did the princes, on how to think and not on what to think. 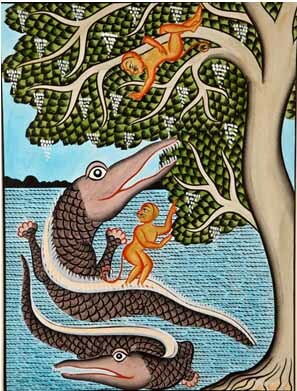 The intersection of the Panchatantra and the narration of epics, fables, stories and religious tenets through art has a long enduring antiquity. Evidence from the 3rd Century BCE attests to this ancient telling of tales through their visual imaginings. The architectural reliefs in the Great Stupa of Sanchi with its inspired architraves that sculptured the story of Prince Vessantara to the 2nd Century narrative friezes depicting the departure of the Buddha at Amravati. The fabulous murals in the rock cut cave monasteries at Ajanta (5th Century) where the Jataka tales and narrations of the life of Buddha were realized through painting all point to this long tradition of narrative art. The art provided lessons in an age of limited literacy, educating pilgrims in the basic canons of their belief. 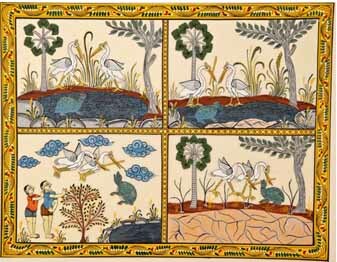 From ancient India to the eleventh century the trend continued, adapting over the centuries to its times with the emergence of a new more personalized format of visual narration, the illustrated manuscript. This tradition took a hold on the imagination and from the development of the narrative manuscripts in Buddhist monasteries to the Jain texts that led to the setting up of great libraries with artists commissioned to illustrate canonical literature including the Kalpasutra and Kalakacarya Katha. In medieval India the intersection between art and narration continued to flourish in the court of the Mughal Emperor Akbar (1556-1605). The enormous outpouring of illustrated manuscripts from the artistic studios established during his rule were eclectic in nature mirroring the Emperors own interests. From classical Persian literature to the great Hindu epics; from history, poetry and fables to stories from the Kathasaritsagar to the Tutinama, and to the best known of all, the Hamzanama were all illustrated. 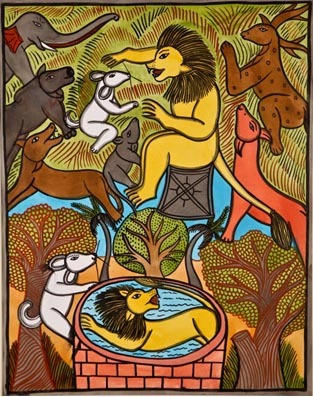 Included too in the long list was the very subject of this exhibition –the Panchatantra. A parallel popular tradition with an equally long antiquity fulfilled similar aims, the visual narratives integral to the process of transmitting knowledge. 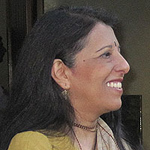 Itinerant picture-narrators known by various names such as Saubhikas, Yamapatakas, Mankhas, Chitrakathis, Pratimadharins, Vagjivanusing scrolls and single sheet pictures dramatized didactic stories. As early as the second and first centuries BCE epic tales and dramas were being performed by itinerants who traveled across villages, acting and reciting stories from the Hindu, Jain and Buddhist traditions, from epics and from local legends. The ancient Jain text the Bhagvata Sutra tells of legendary sage of the Ajivaka sect Mankaliputta Goshala, a contemporary of Mahavira and the Buddha who as the son of a Mankha was trained in the profession. 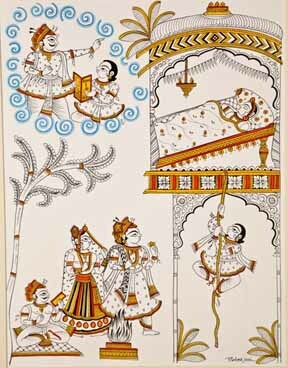 Mankhas are mentioned in several other Jain Prakrit texts with the canonical text Ovaiya including them in its list of public entertainers. In the 12th Century Someshvara III the renowned Sanskrit scholar and Western Chalukya king in his great classic Manasollasa covered a wide range of subjects from kingship to the arts, statesOne who narrates a story with the help of paintings is a great Chitrakathak. 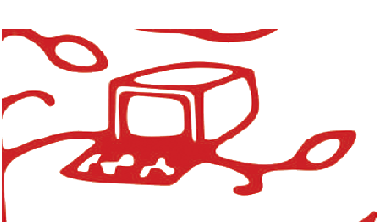 This custom of combining the visual with narrative is in continuum over the millennia’s. 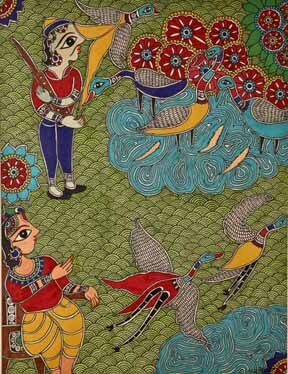 The Bards in Rajasthan recite the legendary exploits of the folklore hero Pabuji with the unfolding of the Phad scroll, the Jadu-patua of the Santhals, the Garoda picture-reciters in Gujarat, the Nakashi in Andhra, the Patua scroll painters and poets of Bengal, the Paithan Chitrakathi and this exhibition at the IIC continue to ignite minds, speaking not only to princes but to all of us – today. 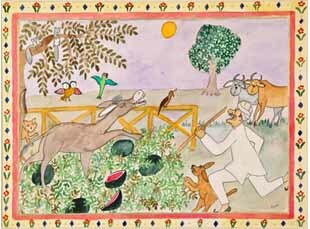 The Panchatantra with its root in all our childhoods is renewed here at the India International Centre in New Delhi as this exhibition – ‘Painted Fables’ brings back a quality of new beginnings, enriching us all with fresh pleasure. In continuum with the narrative art tradition of antiquity the eleven amazing artists exhibiting here have interpreted this great masterpiece with wit and insight. 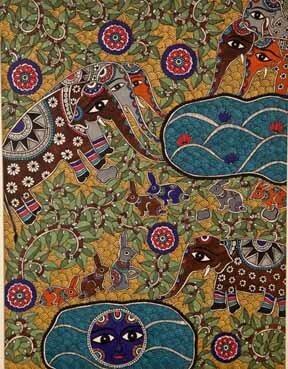 Practitioners of differing artistic conventions from PremolaGhose’s whimsical world-view to Purna Chitrakar’s classic art from Odisha, and the Gond artworks of Venkataraman Singh. From Anwar Chitrakar’s vibrant and expressive PattaChitra originating in the heartland of Bengal to the arts of Madhubhan and the Kalamkari painted cloth panels of Andhra. 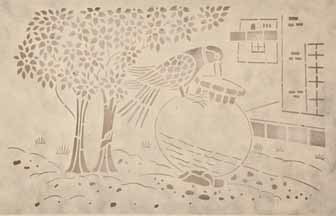 Mohan Kumar Verma’sSanjhi paper-cuts cultivated in the temple rituals of Mathura, Noorjehan Chitrakars’ base in the Santhal arts, the fashioning of Sikki grass into art by Meera Thakur to Prakash Joshi’s reinterpretings through the Phad tradition have allthrough their art given speech to the fables. For It is their tenetthat as long as there are people who want to hear a story these artists will continue to interpret them. 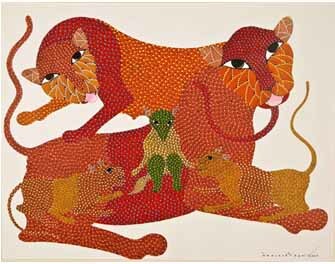 Despite their widely differing individual styles and diverse cultural geographies the artists here share a certain bond – the Panchatantra itself, its fables forming a part of their childhood universe. Therein lies the exhibitions remarkable unity and consistency. All the varied manifestations held together, inspired by this shared beginning, all contributing to the richness of the offering. 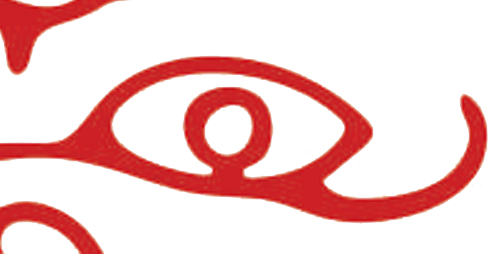 The choices of the fables selected include not only old favorites, but the lesser remembered ones. Containing within their story-lines the essence of the frame that hold the narrative threads together within the structure of the five discourses. As in the fables the values that this collection of artworks is concerned with include the fundamentals philosophies that govern earthly power, glory, worldly pleasures, political life, duty and action. Outlining the perils residing in the trusting of an enemy and the pitfalls of depending on false friends, drawing a fine balance between virtue and vice; the time and place for shrewd strategy to counter brute force, reality and causality. Questions of existence and illusion; of impermanence and the eternal; the significance of action versus repose. The ethics of wise living and moral teachings communicated within individual frames and by the exhibition as a whole. This exhibition full of humor and wisdom, vivid in anthropomorphism and rich in human detail is peopled with kings, queens, ascetics, merchants, princesses, Brahmins , aam-admi and of course with animals standing in for human types, pinpointing human morals. The animals as metaphors and key to understanding the abstract principles of Niti Shastra and the wise way to lead life, helping us identify the cunning of the fox, the craftiness of the crab, the lion as king, the foolishness of donkeys, the selfishness of swans, the sneak in the jackal et al. Within each frame of this richly imagined exhibition the artists open the gateway to the wonder that is Visnusarmas Panchatantra, engaging us like the princes of yore, to ask with bated breath, what happens next? Note written for the exhibition Painted Fables. India International Centre (IIC), New Delhi – February 2014.